KP Photo A Day Challenge & Lots of Winners! We've really enjoyed seeing everyone's wonderful photos this month for the Knitter's Pride Photo A Day Challenge. There is still time to enter your photos for your chance to win through the end of April through Twitter, Facebook, and Instagram - simply use the hashtag #KPpadc when you post your photo! We'd also like to thank the Geeky Girls Knit Podcast for co-hosting this photo challenge with us! After the end of this month, we'll be selecting 10 finalists, all of whom will win a Knitter's Pride Comby II Sampler Set! From these finalists, we'll have our wonderful fans vote to pick the three grand prize winners! 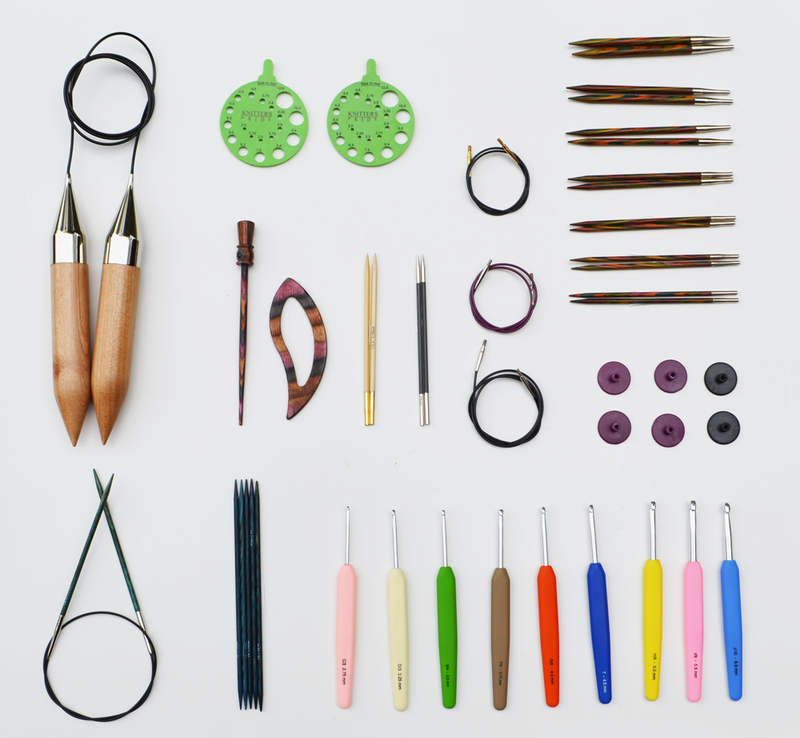 Lining everything up like this is known as knolling, and if you also happen to enjoy knolling your Knitter's Pride tools, we hope you'll share a photo with us on your social media channel of choice! We have a lot of winners to announce today! Congratulations to Instagram user cedwards1183! You've won a Shawl Pin & Clicky Row Counter! Please message us on Ravelry or Facebook to arrange delivery of your prize. Congratulations to Twitter user Aleksandra, @aleksgeniusz, you've won Cable Needles & Removable Stitch Markers! Please message us on Ravelry or Facebook to arrange delivery of your prize. Congratulations to Sara, Jill K., and Jeanne! 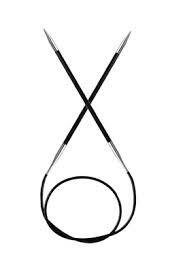 You've all won a Karbonz Fixed Circular needle! We'll be in touch to arrange delivery of your prize. Congratulations to Darlene! 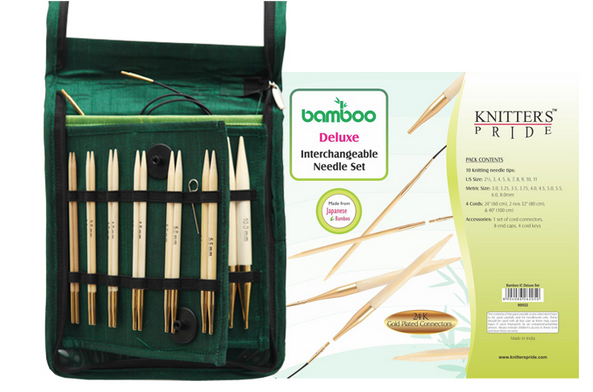 You are the lucky winner of a set of Deluxe Bamboo Interchangeable Knitting Needles! We will be in touch to arrange delivery of your prize! Congratulations to Zabbers, who won the Cafe Au Lait pattern from Holla Knits Spring 2014! We've arranged delivery of your prize, and you should be receiving it soon! Thank you to everyone who has participated! We can't wait for the final round of voting for the Knitter's Pride Photo A Day Challenge, and we hope you'll continue to participate in all of our giveaways and photo contests! The Holla Knits Spring 2014 collection features five great patterns that are perfect for fashion forward knitters. As always, we're impressed with the creativity of the patterns in this issue of Holla Knits, and we're so pleased to be today's blog tour stop! While it's hard to choose a favorite pattern from this season's collection, we'd like to highlight the Cafe au Lait cardigan by Kristen Singer today! This beautiful cable and lace cardigan is knit at a loose gauge to give it airiness and beautiful drape. We think it would be perfect to wear with a dress (as shown here), but it would also look great with jeans and a t-shirt! This is the perfect comfy cardigan that you can wear with just about anything in your wardrobe, no matter what time of year it is. Be sure to visit all the stops on the Holla Knits Blog Tour! 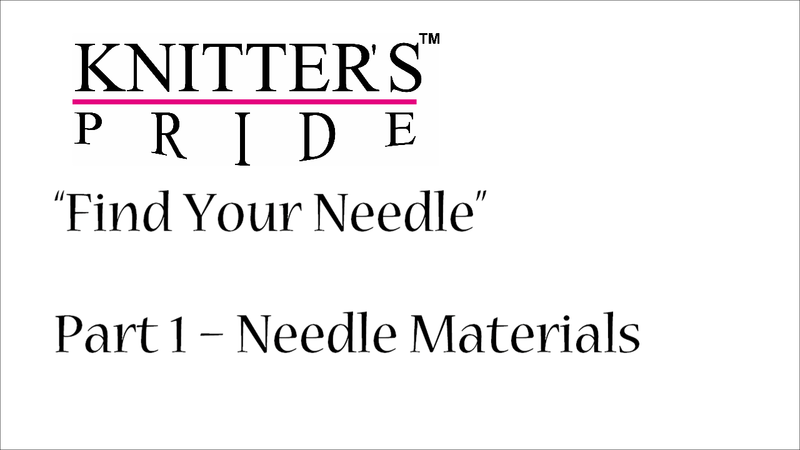 Enter our giveaway for a Knitter's Pride Bamboo Deluxe Interchangeable Needle Set. Click here to enter! We'll announce the winner on the blog on Friday, April 25, 2014. Leave a comment on this blog post and tell us which of the new patterns from Holla Knits Spring 2014 is your favorite for your chance to win your favorite pattern! Please don't forget to leave your Ravelry ID so that we can contact you if you're the winner. We'll announce one winner on the blog on Friday, April 25, 2014. DPNs. I prefer knitting with bamboo needles when working with silver because it helps grip the metal better. You could use straight or circular needles for this project, but since you're working such a small number of stitches I find that double pointed needles are easier to hold and manage while knitting. 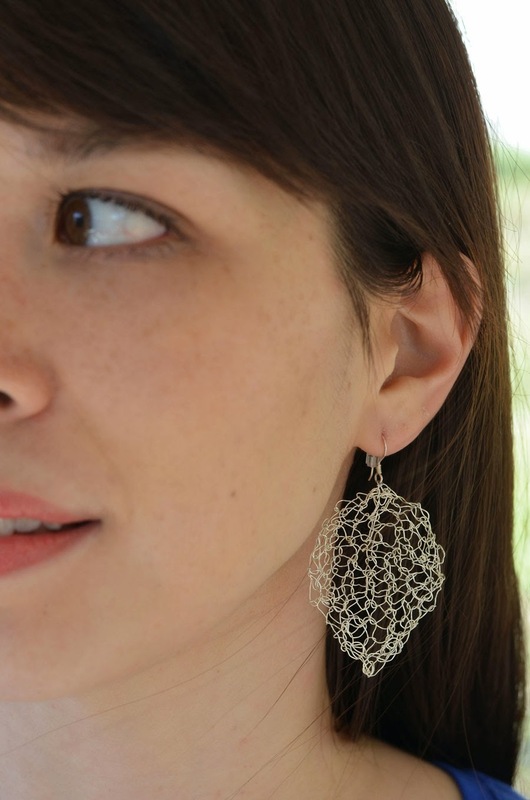 I used US 4 (3.5mm) needles for these earrings, but if you'd like a more open weave to your earrings you could use US 5 (3.75mm) or us 6 (4mm) needles. This will also result in a slightly larger earring. Row 1: K1, yo, k1, yo, k1; 5 sts. Row 2, 4, 6: Knit. Row 3: K2, yo, k1, yo, k2; 7 sts. Row 5: K3, yo, k1, yo, k3; 9 sts. Row 7: K4, yo, k1, yo, k4; 11 sts. Row 11: K1, skp, k5, k2tog, k1; 9 sts. Row 14: K1, skp, k3, k2tog, k1; 7 sts. Row 17: K1, skp, k1, k2tog, k1; 5 sts. Row 19: Skp, k1, k2tog; 3 sts. Row 20: Skp, k1; 2 sts. Row 21: Skp; 1 st.
Cut wire and pull through the last stitch. Using the tail from the cast on attach the earring to the earring wire. Weave in the end through the body of the earring and trim. Weave in the end from the tip of the leave and trim. Shape the earring as desired. This month we're giving away three pairs of Knitter's Pride Karbonz Fixed Circular needles to three lucky readers! With smooth nickel tips, a strong lightweight carbon fiber body and flexible cords these needles are great for all types of projects! For your chance to win, leave a comment on this blog telling us what makes you a strong and flexible knitter or crocheter. Don't forget to mention your Ravelry ID so we can get in touch with you if you're one of our three lucky winners! We'll be announcing the winners on Friday, April 25, 2014.